Cash-based aid is a central part of the humanitarian response in Libya, a country that has been in civil war and open conflict since 2011. As a result of the conflict, Libya has been confronted with a severe liquidity crisis that has made it difficult for civilians to access and use their bank accounts. To effectively address the impacts of the conflict, humanitarian actors have adjusted their programmes to enable cash-based support for vulnerable households. In order to effectively provide this support amidst the ongoing monetary crisis, humanitarian actors have a growing need for reliable, up-to-date information on the funds needed to make ends meet in Libya. REACH and the Libya Cash and Markets Working Group or CMWG first started implementing the Joint Market Monitoring Initiative in Libya in 2017 in order to regularly follow the impact of the crisis on the markets. As the need for more precise data on household expenditure grew, the monitoring initiative was redesigned to include information on the cost of a minimum expenditure basket. The minimum expenditure basket was designed to monitor the prices of a selection of food and non-food items and was largely based on household-level consumption and expenditure data collected by REACH in December 2017. By following the price developments of products such as bread, beans, soap and fuel, REACH and the CMWG have been able to provide humanitarian actors information on the financial burdens faced by households dependent on market priced goods in their respective localities. In early June, the median cost of the core expenditure basket across all assessed markets was 633 Libyan dinars, marking an increase of 2.75 percent from the prices recorded in May. In spite of the general increase in costs, the research team noted significant regional variations. 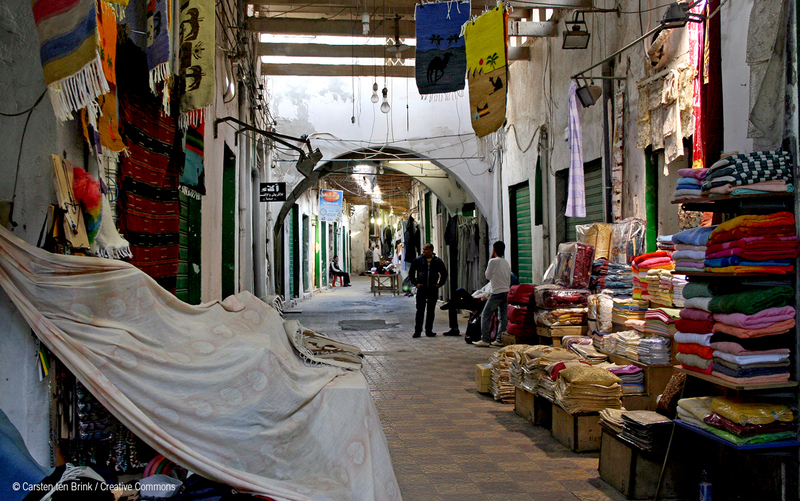 The least expensive basket was found in Tripoli with the overall costs falling slightly below 530 Libyan dinars, whereas the most expensive baskets were located in the remote Saharan cities of Ghat and Algatroun, where the total costs of the basket reached 908 and 910 dinars respectively. The findings of the assessment noted clear spatial patterns both in May and June, with basket costs generally lowest in coastal port cities and highest in southern Libya. This trend was due in part to the extreme distance to southern markets, and in part to the ongoing fuel crisis heavily impacting the south. The lack of fuel has made it difficult to transport goods to and from remote areas and created additional challenges for bakeries and other food producers to maintain their operations. REACH and the Cash and Markets Working Group will continue tracking trends and changes in the costs of the minimum expenditure basket both on country-wide as well as a regional levels. 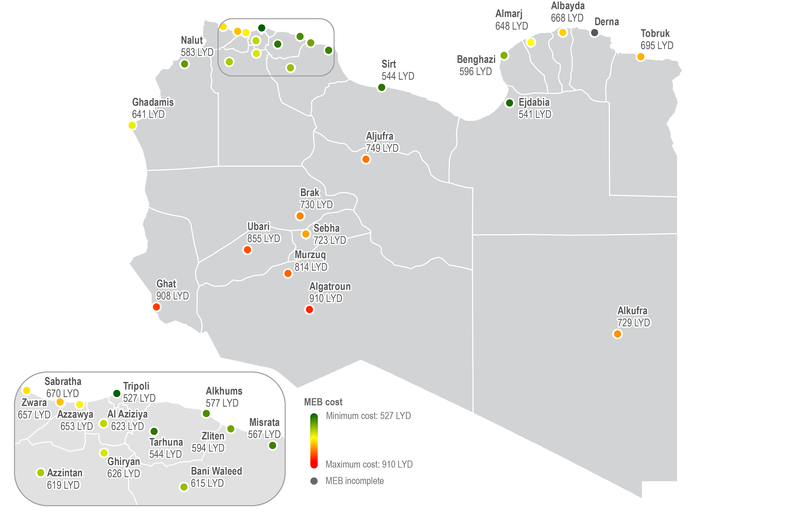 Furthermore, the data collected by the market monitoring initiative is used to calculate standardised, periodically updated cash transfer values for different regions in Libya − another essential process for cash actors as they design their programmes to accommodate the demands of the fluctuating markets. For a more comprehensive overview of the findings from the REACH assessments, visit Libya’s page on the REACH Resource Centre and read the June Libya Joint Market Monitoring Initiative and have a look at the dataset.